Flowering and foliage plants just love the sunshine and rain that were showered abundantly in February. We can see their joy and sense that all’s well by the way they sparkle with luscious growth and dance with colourful blooms in our tropical garden. How wonderful! And somehow, some plants will stand out to outshine the others or to charm us out of the blue as we continue with our gardening passion! One such charmer is Sansevieria ‘Bantel’s Sensation’! In deep slumber for almost two years, the White Sansevieria or White Snakeplant finally decided to wake up and beautify itself early last month. Out of the blue when least expected, it sprang forth two marvelous flowering stalks as payback. 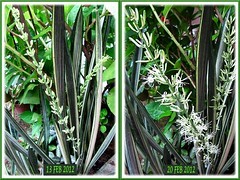 Truly surprised us as sansevierias rarely flower and even if they do, it’s just one stalk, very seldom two! Slim and erect, they were almost hidden from view by the surrounding stripy foliage in white and dark green, as well as blocked by the bushy Blue Hydrangea shrubs that tower above. Fortunately John spotted them during weeding. Anyhow, their presence would have been detected sooner or later when the buds break forth to exude an enchanting fragrance in the late evenings. 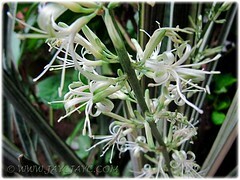 Hmm… the perfume is something to look forward to though the spell will last about 2 weeks until the flowers are spent! 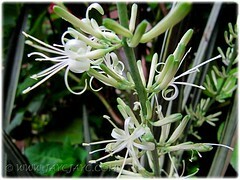 It definitely was our shining star in February 2012 with its charming and angelic white faces, spiraling up the slender and erect flowering stalks, about 70 cm in height. This is the fourth time we got to enjoy the fragrant blooms of S. ‘Bantel’s Sensation’ since its addition to our garden in early 2005. We’re most delighted that it grows and issues offsets easily, to form reasonable sized clumps that can be easily separated to plant elsewhere as filler plants in our borders or as potted plants if desired. Yay… our Oxalis triangularis has resurrected! Another charmer is this Purple Shamrock that almost gave up on us. We’re absolutely thrilled that it is alive again! Though this potted beauty with fascinating trifoliolate leaves has been with us since October 2007, it loves doing the disappearing act once in a long while, probably yearly. It’ll be growing very fine and then without warning, the leaves will just wither one at a time in continuous succession, as if going into a dormant period which it does in temperate regions. Does it undergo a dormant period in the tropics, I wonder? Nonetheless, it always bounces back unexpectedly months later when we just thrash it aside without care. Last November we had wanted to dump it once and for all when it almost vanished with only two remaining leaves. Thankfully, James Missier of Garden Chronicles ‘dropped by’ at the precise moment to share some gardening tips on how to salvage seemingly ‘dormant oxalis’. Following that, I dug up the rhizomes and washed them. The old soil was discarded, the pot washed and filled with fresh moist soil. Then, the rhizomes which were allowed to dry for a few hours were thrust into the soil horizontally, about 1 cm deep and the pot hung under a shelter with dappled sunlight. My darling took over with the caring as he’s more experienced with the watering, knowing fully well that I’d drown them again. It was left unwatered about 7-10 days. Subsequent watering was minimal and twice weekly. Probably, the first signs of success was seen about one and a half months later. Whatever, we’re extremely delighted to be able to enjoy its lovely presence once again. Our deepest gratitude and thanks to James, of course. 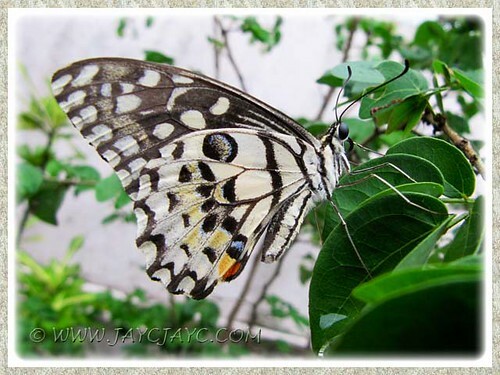 Another garden star that loves to pose for me is the Lime Butterfly (Papilio demoleus). So, I’ll do it justice by presenting its effort in this photo taken about two weeks ago, in February too. It is a frequent flyer to our little paradise and easily photographed as it likes to stay rather long at the same spot. Enjoy! 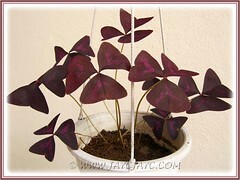 I like your butterfly photo, and that plant that looks like butterflies – purple shamrock. Will have to look out for it! I’m glad that it had worked out well for you. Great to hear this news. Now I’m pretty sure Oxalis is going to be a permanent resident in your garden. You can actually break the bulbs into half and plant them to have more plants. 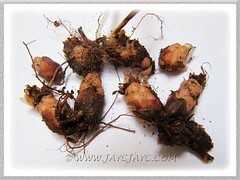 Right now I have about 7-8 pots of Oxalis mixed together with other plants. @ Gillian : Thanks, Gillian. The butterfly still had its wings intact, not tattered even though it’s an aging one. A younger one would be more brilliantly coloured as pictured here. I want to provide information about the plant is of oxalis triangularis, ours’re like, enter period of rest and then flares up, is something that makes her flowers after show. 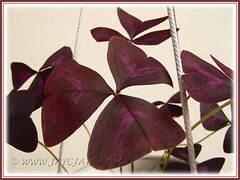 Yara, do check out our article of this beauty at https://www.jaycjayc.com/oxalis-triangularis-purple-shamrock/ for more info. Sorry, I don’t keep tab of its growing process but I think the plant has to mature to a reasonable size before it flowers.